Handpainted Hairbow Holder with Pink Turtle - This sweet little turtle does double duty as kid's art and storage solution. What a fun way to help your little girl stay organized. Even cleaning up can be fun with storage accessories like this. Put this handpainted hairbow holder in her bathroom or bedroom to keep track of all of her bows and barrettes. We would love to personalize it for free! 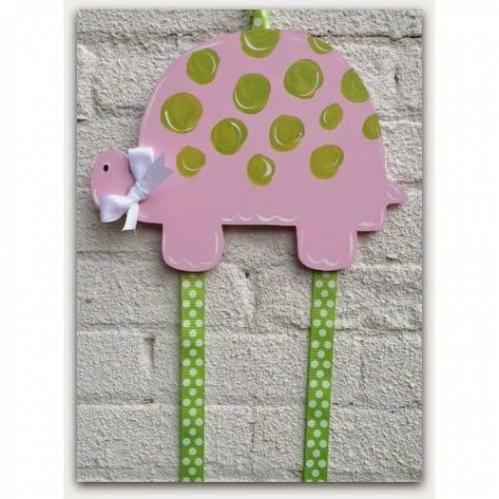 Full Description Handpainted Hairbow Holder with Pink Turtle - This sweet little turtle does double duty as kid's art and storage solution. What a fun way to help your little girl stay organized. Even cleaning up can be fun with storage accessories like this. Put this handpainted hairbow holder in her bathroom or bedroom to keep track of all of her bows and barrettes. We would love to personalize it for free!